Remember, unsolicited donated goods such as used clothing, miscellaneous household items, and mixed or perishable foodstuffs require helping agencies to redirect valuable resources away from providing services to sort, package, transport, warehouse, and distribute items that may not meet the needs of disaster survivors. But it looks terrific on TV. Readers point out that the White House’s response to the hurricane is far less campaign-esque than Romney’s, so take that into account when you read my headline. 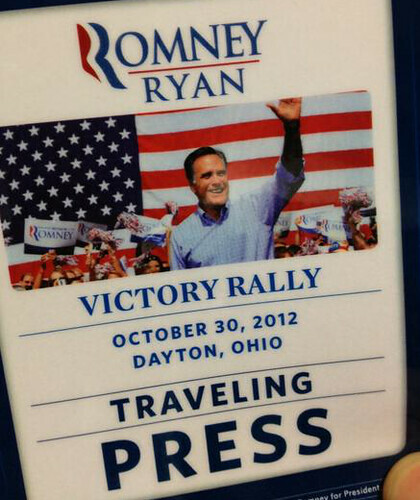 And the event began with the video of Romney, The Leader, that plays at most Romney-Ryan events. See, here’s the problem: There is almost no way an incumbent president or a challenger can help disaster recovery with his physical presence. A presidential campaign is preceded by secret service and trailed by a swollen press entourage. Traffic must be routed around the area where the candidate/president is speaking, until the guy leaves the site. What possible purpose does that serve when people are scrambling to collect aid? I’m really not criticizing Romney here – I don’t see the upside of any politicians swooping in to “get some devastation in the shot,” as Bill Frist infamously told a cameraman in Haiti. This is a situation in which Chris Christie’s bravado is sorely needed. Why the hell would he? Mitt Romney doesn’t run anything. He cannot direct government resources anywhere. He’s said he would cut FEMA, actually, so when he arrives, reporters get to ask you questions about whether you agree. Don’t let them! Tell the candidates to campaign in dry states where no one is especially inconvenienced by a giant, stupid security perimeter.